A “broad range” of issues were on the agenda during a private meeting between the Prime Minister of Canada and the Premier of Newfoundland and Labrador on Friday. Before shutting out the media, Justin Trudeau and Dwight Ball had a brief photo op, where they revealed some of what would be discussed. Trudeau agreed, saying it was a priority to “move forward positively” on the Atlantic Accord discussions. They hope to finalize the Atlantic Accord review by the end of March. Earlier in the day, Trudeau took a tour of Memorial University’s core science building, which is still under construction, and gave a speech to Liberal donors at the Alt Hotel in downtown St. John’s. His speech focused on how faith in public institutions is dissipating around the world — he mentioned the United States, France and the United Kingdom, but neglected to mention the burning issue of the SNC-Lavalin affair at home. “There’s a time right now where people around the world are mistrustful of their institutions, worried that they are not being supported in the transformations of the world around them. And that’s causing people and the democracies around the world to lash out in various ways,” he said. Not only did he leave out any mention of tensions in Canada, Trudeau said his government is doing just the opposite. During the tour at Memorial University, Trudeau was asked about the SNC-Lavalin scandal. He said people should pay close attention to comments made this week by Clerk of the Privy Council Michael Wernick. “Canadians expect us always to be standing up for jobs, to be making sure that we’re protecting economic growth across the country, and indeed promoting it. That is one of the fundamental jobs that anyone expects of their government,” Trudeau said. Playing to a local audience, Trudeau recounted his bachelor party in Newfoundland — when he and MP Seamus O’Regan went seakayaking in a snowstorm, and Trudeau says he got thrown out of the Sundance on George Street. During the tour at Memorial University, Trudeau was asked by reporters about the Muskrat Falls hydroelectric project, which is over budget, behind schedule and the subject of an ongoing public inquiry. He was asked whether or not there would be another federal loan guarantee. 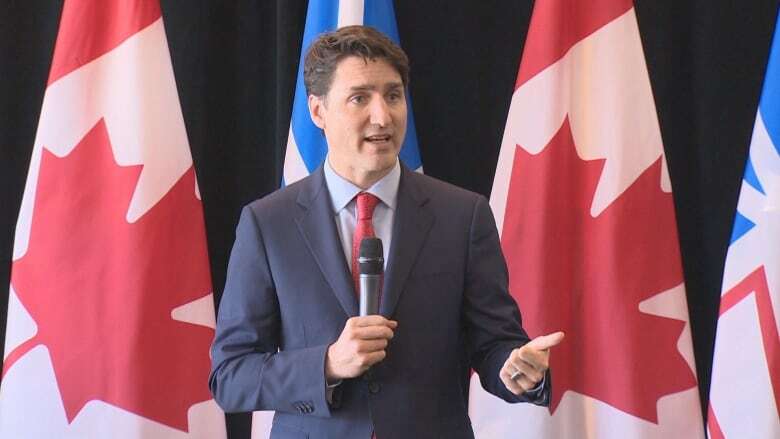 “We will continue to work with the government of Newfoundland and Labrador on ways to ensure that the cost of living is affordable, like we do right across the country,” Trudeau said. Trudeau was also asked about the Atlantic Accord, as well as a replacement for the aging Her Majesty’s Penitentiary. Again, Trudeau deferred to discussions with Premier Ball. Their meeting convened at 1:45 p.m., with Trudeau scheduled to head to Toronto on Friday evening. He flew in from Nova Scotia Thursday evening, and the trip to St. John’s is, in part, a fundraising stop, as Canadians and politicians get ready to vote in an October federal election. Though he will be talking with some provincial politicians, Natural Resources Minister Siobhan Coady has said she had “no plans at this point” to discuss the ongoing saga of Muskrat Falls — and any potential financial help from Ottawa — with the prime minister during his brief visit.